A question we often receive is, “How do you come up with your stories?” The best person to answer that question is our author, Phil Haussler. We sat down with Phil to learn about his inspiration for our personalized book, God Whispered Your Name. MarbleSpark: Where did you draw inspiration to create God Whispered Your Name? PH: The personalized book is a retelling of the creation story found in the texts of the Abrahamic religions, Christianity, Judaism and Islam. Once I decided to go down that path, I really had much firmer storytelling constraints than I’m used to. Constraints might seem like the last thing you’d want on a creative project but, often, constraints can serve as a catalyst for creativity. As you can imagine, drawing inspiration from holy books can be a bit daunting. I started by reading the creation story and trying to distill down to its core essence, which for me came down to one thing: you were no accident. That idea is what inspired lines like “You see, God had a plan at the very beginning…He had you in mind, when He set the world spinning.” And it’s the reason I originally titled the book, God Gave Us You. 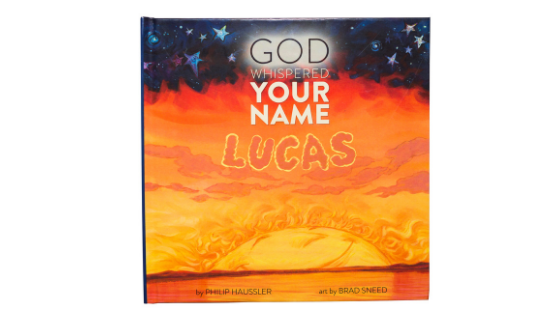 MarbleSpark: So how did the book come to be known as God Whispered Your Name? PH: We did a limited-edition run like we often do for friends and family and our biggest fans. This gives us a chance to make sure we’ve got all the typos worked out and any technical bugs fixed. Somewhere in those first few weeks, we realized that there was another series of books using the title, ‘God Gave Us…’ including one called God Gave Us You. I was sick. I really loved that title and thought it perfectly summed up the essence of the book. And none of the other options were coming anywhere close to feeling right… I was distraught. After over a year working on this book, having to rename it felt… wrong. Voila! God Whispered Your Name was born. As hard as it was to let the working title go… I think we ultimately found the perfect title. 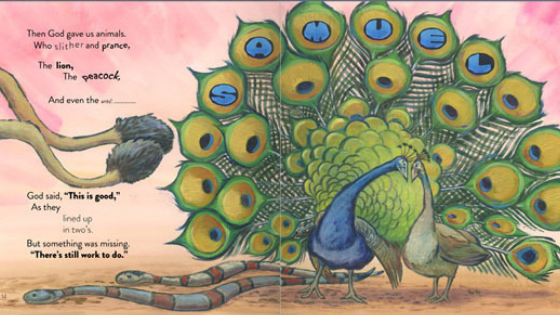 MarbleSpark: How did the illustrator, Brad Sneed, play a part in shaping the book? PH: I believe it was Brad that ultimately convinced me the new name was better than the old name. But long before that, Brad’s fingerprints were all over this book. 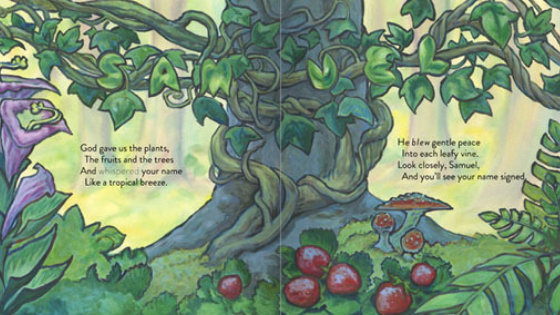 One thing that stands out is that Brad and I shared the vision that all of the illustrations in this book should be ‘spreads’, meaning the illustration — and in this case the child’s name — would span both pages and jump across the binding or ‘gutter’. This required Ken Wiebke, our technical cofounder, to develop some new magic to make the technology work. MarbleSpark: What is your hope for kids as they read this book? PH: I want them to feel as special as they really are. I want them to know that they’re a miracle, a work of art. That they were designed with great joy and intention. And I want the people reading it to them to get a little reminder themselves. Remember, mom, you were designed with great joy and intention. Listen, grand-dad, there was a plan for you at the very beginning. That’s a reminder every single one of us needs once in a while.